How to Remove Pet Hair From Carpet and Upholstery in Boulder, CO. Call 303-530-06436. For more articles like this, go to Cleancare Articles. Rubber Gloves: Due to an influx of natural cleaners, many homes don't keep rubber gloves around like they used to, but they may very well be the easiest and cheapest way to remove pet hair from your sofas, chairs, and vehicles. There's no trick or gimmick with this tried and true method of pet hair removal. All you need is a pair of typical rubber gloves found in the cleaning aisle at your local grocer or big box store. Slide them on and you're set to get frisky with your sofa and car interior. After a good rub down (hubba hubba) the fur should lift and stick to the glove. Simply submerge your hands in water and the hair will unstick and float on top of the water for you to gather and dispose of. You can of course remove the excess fur without water, but we've always been fans of the quickest and easiest method possible, and from experience, I can say this works like a charm. Flip Flops: Slip a rubber flip-flop on to your hand and rub carpets and rugs in the direction of the pile. 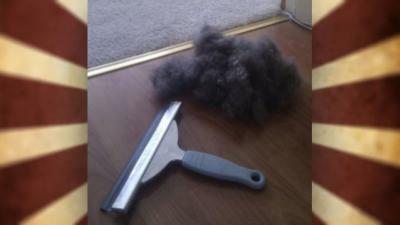 Any pet hair will form into balls that can then be vacuumed up. This works well on upholstery, too, including car seats. Squeegee: If you have a pet and your vacuum cleaner leaves something to be desired, that squeegee in your bathroom can work wonders on stubborn pet hair in the carpets as well as on your furniture. Just run the squeegee (Stick a pole in it if you don’t want to do this on your hands and knees) along the carpet and watch the hair come right up. Seems like this wouldn’t work, right? But, it does– look at the above picture! And for more severe pet problems and messes, click on our Pet Concerns page and see how we’re ready to help you. Try Us For Free. 100 Sq Feet Trial Cleaning.